In the line frequency state, the motor adopt star triangle step-down delay startup, and the current is 4～7times of rating current. If there are several high-power motor startup at the same time, it will make great impact to electric network. If it adopt the frequency control, the motor can soft starts at rating current, the current smooth and have no impact, so to reduce the impact of startup current to motor and electric network and prolong the useful-life of motor. When the injection molding machine is append a variable frequency inverter, the speed analog variable of plastic machine have no output, and the motor stop, the hydraulic system have no pressure, so avoid the misoperation of mechanism, and put an end to the personal safety accident when the operators take piece from the mold, clean and repair the mold. The reactive power not only add the line loss and the heater of equipment, but also induce the reducing of the active power of electric network because of the reducing of power factor. When use the frequency control saving energy system, the power factor approach 1 because the function of filter capacity of frequency inverter, so as to increase the active power of electric network and save the power wasted by reactive power. The injection molding machine usually use triple asynchronous AC motor which cann't vary its speed, the constant vane pump which drags and the flux of output hydraulic oil cann't be varied. The plastic machine which operation at the low speed, excess fluid is returned via overflow valves to the fluid supply ,and the energy is wasted. 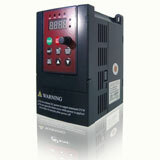 The frequency inverter can adjust the speed of motor according to the function of control system, and can vary the flux of hydraulic oil output from vane pump according to the speed of plastic machine action, and reduce the energy waste of hydraulic oil from overflow valve to oil supply, so to save more power. 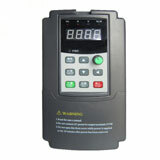 According to the products of injection, the inverter saves energy can be 20～70%. 1. When the injection molding machine is append a frequency inverter, the rotate of the host motor vary with the speed of the action of plastic machine, the injection produce cycle is short, the frequent rotate of action will lead the actor in the process of deceleration, and the response time of reducing and increasing the speed of motor is long, it will lead the increasing of the time of injection cycle and the reducing of productivity. The frequency inverter and plastic machine computer can carry online control, through the control of computer to variable frequency inverter, it can realize the decoupling adjustment of the output frequency and output torque of inverter, and reach the optimal match of the frequency inverter and the action of the injection process, so it can resolve the choke point of efficiency reducing which is result from the application of frequency saving energy technology in plastic machine. 2.With the decrease of the motor rotate and the fan blade rotate which is jointed with the motor rotor, so it lead the badness of motor rejection of heat. Additional, the insulation effect will decrease of the insulating layer impacted in conversion voltage of frequency inverter insulate. Now, the frequency inverter produced by motor manufacturer aim at the two point and make the improvement, the motor fan are independent with the rotor, and the rotation cannot be affected by the decrease of the motor speed ,the insulation layer adopt the excellent material, so as to resolve the matter that frequency inverter impact the motor lift. 3. It mainly depend on the rotor of high speed kicking the blade out, so to reach the aim of oil suction. If the rotate of rotor decrease, the blade will not have enough centrifugal force and cannot effective compress the stator surface, so the leakage of bump will increase, and the efficiency will decrease, when the rotate decrease to the critical value (e. g 400r/min), the oil suction capacity will become bad, even it cannot yield oil, when appear the question, it must increase the efficiency set signal gain. Besides, the development of crescent gear pump will replace the vane pump and become the developed mainstream of the plastic machine oil pump, accordingly to resolve the question of the badness of the oil suction of the low speed of the vane pump. 4.When LP mold close and slow speed mold open, the frequency inverter operate at the low speed and great torque, the current easily exceed the rating value and make the overcurrent protect, the input end of the frequency inverter are set the enter point of mold close and open, which is linked with the output point of the mold close and open of the plastic machine computer, through the specifically variable frequency inverter software let the motor keeping the motor running at the high speed when mold open and close, avoiding the emergence of the low speed and great torque.